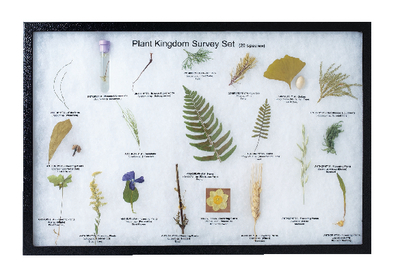 The plant kingdom survey set riker mount offers a diverse overview of the plant kingdom. This large display features the diversity of kingdom plantae with representatives of seven plant phyla. Twenty fully labeled specimens from the Anthophyta, Psilophyta, Bryophyta, Coniferophyta, Gingkophyta, Lycophyta, Pteridophyta, and Arthrophyta are featured.